This card also uses my VERY favorite color combination – blue and green. We re-painted a number of rooms in our home as part of The Renovation, and almost every can of paint was blue or green. As a matter of fact, our bedroom is now River Rock with an accent wall in Not Quite Navy. Seriously. This was another card in the Manly Card series, and though I did sneak in a little smidgen of ribbon you’ll notice there’s no sissy bow. It’s a manly Tie Your Tie sort of knot. The tree is easy to stamp in two colors if you use an ink pad to color the leaves and then remove excess ink from the branches with a Blender pen and color the trunk and branches with a marker. I am still putting things away in my fabulous new crafting space, and am discovering that I have kept a lot of STUFF. Getting rid of things you don’t need any more is a wonderful feeling. Crafting in this room is a total joy, and sometimes I stop mid-project just to look around me. It’s pretty sweet. I haven’t been following you for very long but I love your site! Reminds me of the one and only trip to your beautiful state. Your cards are are simple enough for this “old” bag to follow and I keep looking for your emails. Please keep them coming! 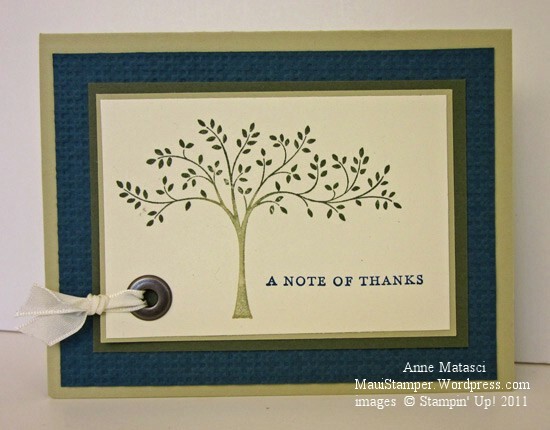 Beautiful card, Anne! Simple, but so pretty. Can’t go wrong with that tree.